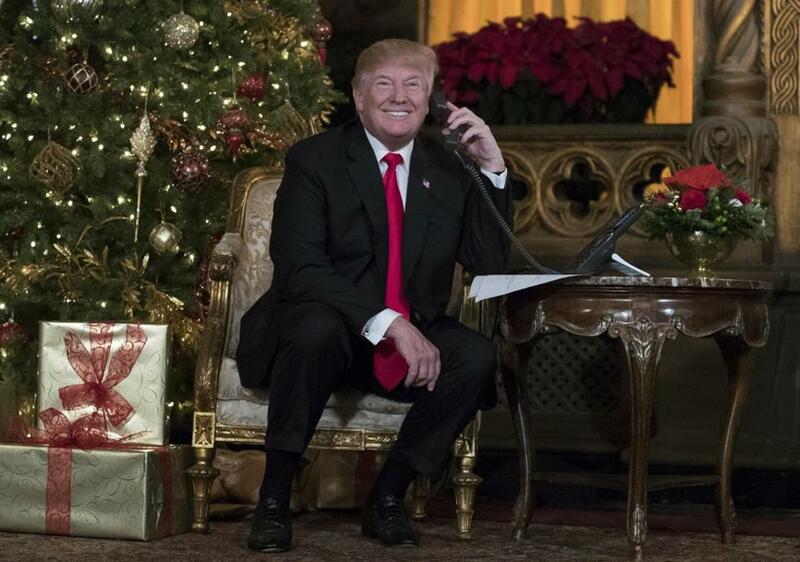 President Trump on Christmas Eve. In his first year in office, President Trump redefined both political parties. In 2017 you could not call yourself a Republican unless you fully supported Trump. At the same time, you could not call yourself a Democrat unless you pledged to resist Trump at every step. In 2018, Trump may flip the script again by creating a major fight within each party. Following his victory last week on the tax overhaul bill, Trump’s aides have signaled that they want to spend the first part of the year passing a robust infrastructure plan. There isn’t a specific bill on the table, but the White House has signaled that it wants something that could cost $1 trillion. That kind of big plan to fix railways, airports, and roads is exactly the type of investment that Democrats have been calling for since the Great Recession. So Democrats face a tough choice: Either stick it to Trump or go along with him and achieve a long-sought objective. As for Republicans, they will find this type of massive spending really hard to support. After just adding an estimated $1.5 trillion to the debt by passing the tax overhaul bill, can Republicans really call themselves fiscal conservatives if they pass a mammoth infrastructure bill? It’s already becoming clear how difficult it will be to pass the bill in a Republican Congress. Trump is scheduled to meet with House Speaker Paul Ryan and Senate Majority Leader Mitch McConnell next weekend. Ryan doesn’t agree that infrastructure should top the priority list. He wants to move ahead with cutting entitlement programs, partly as a way to help offset the recently passed tax cuts. McConnell sees a new Democratic Senate member from Alabama narrowing the GOP majority to just one vote. He said in an interview last week that the Senate would need to be more bipartisan to get anything done and, looking at the math, he isn’t promising too much of a legislative agenda in 2018. A large infrastructure bill could pass — but only with an odd coalition of Republicans and Democrats backing it. And while those who vote for it will have a lot of projects they can brag about delivering to their home states, they will also have to do a lot of explaining to their bases. In Massachusetts, for example, extending the Green Line on the T is one of the projects on a 70-page draft list of infrastructure projects that could be funded in such a bill. Is it worth it for the state’s Democrats to give Trump a win if it means finally extending the T after decades of talking about it? What about a Republican from a rural state? Is it worth saying yes to a bill that helps Trump even if it largely helps more urban states with their infrastructure needs, using your constituents’ hard-earned tax dollars? The choice might be clear for Democrats, who can give a rare win to Trump if they can get major benefits for their constituents. But for Republicans there’s another twist. The type of moderate Republican who would be most likely to vote for such a plan would be exactly the type who could be most vulnerable to a primary challenge from the right. They will have to think twice about their votes. Either way, the politics of infrastructure reform will probably be unlike anything we have seen in Washington for a long time. For that very reason, it may never go anywhere.